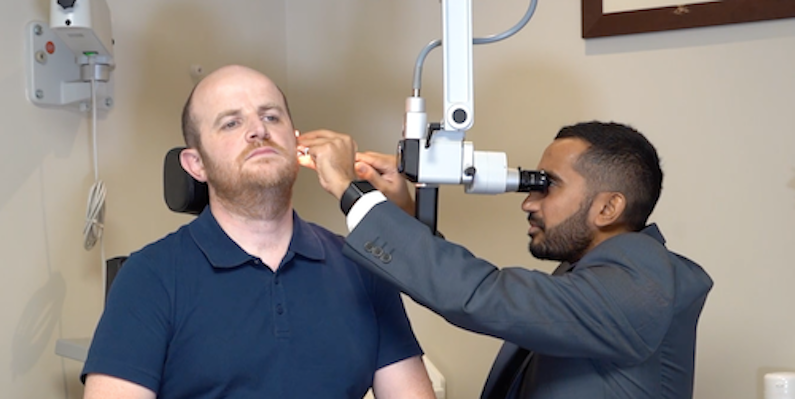 Microsuction ear wax removal is the safe, modern way of clearing ear wax from the ear canal. It has a number of benefits over more traditional methods of wax removal and is the preferred choice at Pindrop Hearing. Using a very small suction tube, we’re able to get deep inside your ear and literally Hoover up the excessive wax, removing it completely. No water is involved at any stage of the process which makes it less messy than more traditional methods, such as syringing. It’s also a lot safer, faster and preferable than more traditional methods and because we’ve done so many here at Pindrop, we’ve gotten very good at it! If left untreated, a buildup of ear wax (cerumen) in the ear canal can lead to a host of symptoms and significantly reduce quality of life. For example, It’s very common for people with excessive wax build up to have reduced hearing in the affected ear. Earache is also very common and more generally, a sense of irritation around the ear. In some cases, patients will develop a buzzing or whistling sound in their ear (known as tinnitus) which can be extremely annoying and also quite scary. Many GPs no longer offer wax removal and if they do or if you get referred, there can often be long waiting times leaving you to deal with your symptoms for months. Good news though, in the majority of cases all of the symptoms associated with wax buildup disappear as soon as the wax has been cleared. Microsuction wax removal is available at our clinics in Harley Street and Winchmore Hill and you can be seen within days. Click here to book.